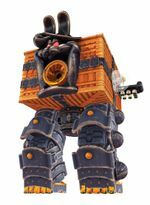 RoboBrood is a giant robot piloted by the four Broodals. It appears as the boss of Bowser's Kingdom and Dark Side in Super Mario Odyssey. RoboBrood's main body is a large cube that appears to be made of wood. On the front is a large cannon in the likeness of Madame Broode and on the other sides are domes where the Broodals ride. Spewart rides in the right-hand dome, Rango in the left, Hariet on the top, and Topper in the back. RoboBrood has two large legs that are usually covered in metal armor. It also appears to have paper lanterns hanging from it, fitting the Japanese-style kingdom it is first fought in. RoboBrood attacks by stomping around and shooting bombs from its cannon. Along with the bombs, it will fire a Pokio, which Mario must Capture. Mario can then destroy the armor on RoboBrood's legs either by pecking it or by knocking bombs back at it. Once the armor on one leg is destroyed, the robot will fall onto its left side, allowing Mario to climb up and attack Spewart's dome to knock him out. RoboBrood will then get back up and restore its armor, which must be broken again to knock it onto the right so Rango can be defeated. After this, RoboBrood will use two new attacks, charging at Mario and shooting discs that spin around the arena. Once again, a leg must be disabled to cause RoboBrood to kneel down so that Hariet can be attacked. Once the leg is disabled a final time, RoboBrood falls on its "face", allowing Mario to defeat Topper. Once all of the Broodals are knocked out, RoboBrood falls apart in a series of explosions before launching into the sky and exploding in fireworks shaped like its pilots' faces. RoboBrood appears again as the final boss of the Dark Side. This time, it does not release Pokios and Mario must instead take control of a nearby Hammer Bro. Aside from the fact that the battle takes place in low gravity, the fight is the same. It is possible, however, to defeat RoboBrood here without capturing the Hammer Bros. The background music for the fight changes depending on whether or not RoboBrood is standing. The Broodals can actually be defeated in any order, providing the player has the proper method of defeating them (for example, by climbing on the wood panels placed on the robot's legs with a Pokio). ↑ MayroSMM. (November 7, 2017). [SMO] Robobrood WITHOUT Hammer Bros (Post-Game Spoilers!). YouTube. Retrieved May 4, 2018. This page was last edited on March 31, 2019, at 17:15.